Stefan Sobkowiak describes himself as a synergist, permaculturalist and an irrepressible optimist. A landscape architect he specialises in attracting bird, insect and animal allies into his designs. Over the last 6 years he has focused on Miracle Farms, the largest permaculture fruit orchard in Eastern North America. Stefan was featured in the film The Permaculture Orchard, and was in Dunedin as part of the BeyondOrganics tour. We need to say, we really want wildlife in our backyard. If you build it they will come, you might have to help a little bit. Most orchards are biological deserts. It is the life that will change the soil. We need to reconnect with food. Sustainability is just keeping on keeping on, it means over the years we’ll continue and we’ll hopefully still keep harvesting and doing the way we’re doing. And that’s better than a mining system – taking what previous generations have built up, and you are squandering it in your practices…sustainable at least you are keeping on keeping on, and you’ll be able to keep on that way. But to me that’s kind of short-sighted – why would you want to settle for sustainable, when you can actually grow or farm in a way that you will leave that property – because everybody is a steward of the land they are responsible for – why would you want to leave it the way is is, why wouldn’t you want to leave it better than the way you got it. If everybody started with that approach,we wouldn’t need to clear more land for farming, because every farm would gradually produce more, and get better and better, you wouldn’t have the problems of flooding because the soil would hold more water…it would solve so many of our problems. Why not want to actually improve the situation? (Activist?) No. Just a practical guy. I just want to save the world, that’s all, not much to aim for. If everyone would take on that approach with one thing that they can actually change – and for me it’s orchards for now. (Motivation) Seeing change in a positive direction. I’ve gotten a lot more pragmatic, I’m not looking to change people, but I do realise that when people are open for change, and they’re hungry for change…seeing people really connect, going “now it makes sense..”. People really realise that we need to work with nature. 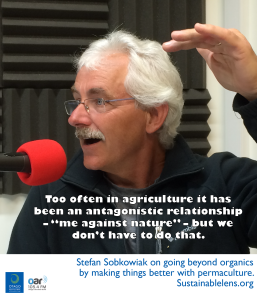 Too often in agriculture it has been an antagonistic relationship – “me against nature” – but we don’t have to do that. I invite every element of nature – I have to adjust. If there’s something not working the way I’d like, then there’s something I don’t understand. I just need to realise what I need to add to add to that system so that they will either fall into balance where they are not causing me economic hardship, or I need to realise “hey they’re there, I need to adjust my attitude”. Often all it is, is that I need to produce more. If we have one fruit tree and we expect to get all our fruit we’re kind of dreaming, because the birds will get most of it, but if we’re growing 10 of them, chances are we’ll have some, if your neighbour grows ten more, then you’ll have a lot more, and so on. The problem is not that we can’t do it, it is that we’re doing it on far too little a scale. (Challenges?) Scaling up. Scaling ideas of implanting the orchard. Once you do one, people will look over the fence and see ideas that make sense. (Miracle?) A change in people’s heart. You can talk about anything until you are blue in the face. But until people have a change of heart, a lot of things won’t change. You really have to want to change. (Advice?) Just start, get going.